Color preference expresses a person's prevailing emotional state and the condition of their vital force. It is a reliable general symptom that is easy to determine and does not require any interpretation. 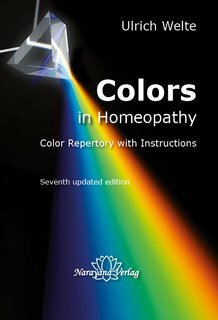 Color preference helps to precisely determine the best remedy and can be used as an additional symptom regardless of the homeopathic approach being used. The relationship between colors and remedies was discovered during decades of clinical research, starting 30 years ago with Dr Hugbald Müller from Cologne, continued primarily in the Kandern practice, and now being further developed on a worldwide basis. The color preference of well over 10,000 patients has been systematically checked for many years. Only the cases of those patients who were healed or who showed significant improvement were then evaluated. It became clear that the patients who were cured by a specific remedy had the same color preference. The color symptom was therefore not simply theoretically assigned to a remedy but this connection emerged naturally. The sixth edition has been greatly extended. It includes for the first time the relationship between color groups and remedy families. For example, turquoise contains the Natrium and Lithium compounds, the Anacardiaceae, and the snake remedies. This broader perspective allows more scope for remedy selection. 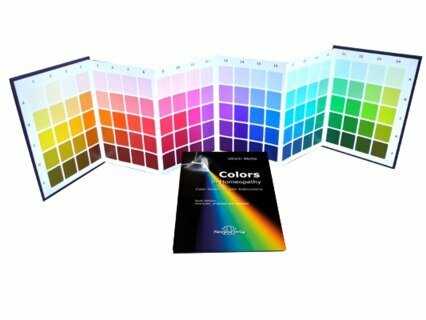 One or two color preferences have been assigned to over 1100 remedies. Color preference can therefore be used as a key building block in remedy selection, a method that proved helpful for over 50% of cases in a clinical trial. In addition, the remedies of the color rubrics are arranged according to Jan Scholten's series for the first time: the plant remedies contain the codes from Scholten's new botanical system. It is therefore the first repertory that contains this system of classification. "This reference book only contains text, tables, and explanations. It is a supplement to the color charts and can only be used together with these." I really enjoy using this book for confirmations and differentiation. Very often it helped me to make final decision, e.g. choose which one of the bird remedies. I even had a great result with color blind patient. It works wonderfully with children, since they are innocently not into trends and styles. It is really fun for me to work with colours!